I tried, but I was a lousy teacher back then, and I didn’t have the online tools that I do now, such as the videos and lessons in my Sole Fundamentals and Sole Mastery programs. I was also still working in high tech and majorly stressed out. No surprise then that the family was simply not in the right frame of mind to help my grandmother with Chinese Reflexology. I share this story because I often receive questions from people desperate to help their loved ones, and they ask me which points to massage. My heart goes out to you, and I can empathize with what you’re experiencing, and I applaud you for your big heart and desire to help. But if you write to me during a time of crisis, there’s not much I can do to help you. The other challenge to recommending points is that I don’t know your strengths or weaknesses. I don’t know how competent you are with locating and massaging the points. And when all I get is an email out of the blue, it’s harder for me to connect with the energy of what’s going on so it’s difficult to offer intuitive insights. If you’re a student in one of my programs, I can better help and support you because I get to know you. And that’s why I recommend people take my Sole Fundamentals program. After studying with me for six weeks, we speak the same language. I get to know you as a student. I know that you know where and how to massage points because you get feedback with the Checkpoint Reviews that are included as part of the program. You take a photo of a reflexology point marked on your foot, and then I draw right over the picture to show you exactly where the point is on YOUR foot. I also know that you understand the Chinese Medicine theory behind why you massage the points. The why is as important as the how. With this common language and connection, I know how best to advise you. Without it, all I can give is generalizations. When I get an email from someone who isn’t a student, it’s like a concert pianist getting an email asking for tips on how to play the piano. The pianist can’t really help if the other person isn’t sure where to place their fingers on the piano keys. I try to support people who email me as best as I can. But when a loved one is sick, it’s better to know how to practice Chinese Reflexology before you need to. It’s better to have experience with the techniques that help you get in the right mindset for healing before you face a stressful situation. Which Are the Best Points for a Chronic Health Condition? If you’re wondering which are the best points to help someone you love, for any long-term health issue, my honest recommendation is always the same. No matter if you’re asking for your mom, dad, aunt, uncle, sister, brother, or yourself, the answer is always the same. It also doesn’t matter what the health condition is either—vision problems, digestive issues, high blood pressure, stroke, allergies, etc. After answering variations of the same question (“Which points do you recommend for…?”) hundreds of times, I noticed that the answer was always the same. It didn’t matter what the health condition was. I always responded the same way because the points to massage were always the same. The answer is always the same: You should massage all of the points. That’s because Chinese Medicine is about holistic healing and addressing the body as a complete system, and adjusting based on the individual. The more points you massage, the more holistic and synergistic the approach. 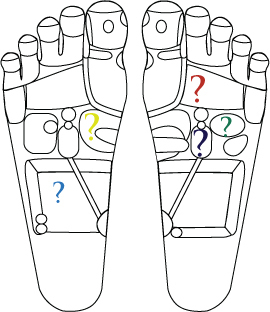 However, there are over 50 Chinese Reflexology points. That’s a lot to learn and impossible to do in a day if you want to help someone you love right away. So the next best thing is to learn how to massage the most fundamental and powerful points before you need to know how to massage them. And that’s why I created the Sole Fundamentals program. It’s a focused online program that answers the question, “Which are the best points for you or a loved one?” The program is designed to give you the most knowledge and benefit in the shortest amount of time possible. It’s different from my book because the six-week program is a guided experience. You get support and feedback from me. You get answers to your questions. It’s six weeks of focused learning to ensure that you are confidently and correctly locating and massaging the points. When you’re first learning how to massage your feet and everything is new, the sole of the foot looks like a mysterious blank canvas. It’s not surprising then that about 90 percent of students need some tweaking for where points are located on their feet. Sometimes people wonder how I can recommend point combinations on my website, but I can’t give them a list to five points to massage. It’s because each person is different and symptoms appear differently in people depending on the underlying energy disharmonies in their bodies and the interplay of these disharmonies. The recommendations on my website are for conditions that are either very simple to rebalance (e.g. common cold), for treating symptoms but not the root cause because symptoms are easier to address (e.g. allergy symptoms), or for getting started, but the underlying root imbalances still need to be addressed on an individual basis for long-term benefit (e.g. high blood pressure). One reader chastised me for not giving recommendations for Parkinson’s disease. It’s not that I don’t want to help, but treating Parkinson’s disease is a lot more complex than treating a common cold or knee pain. It takes years for Parkinson’s to develop. And my recommendation for which points to massage for Parkinson’s would still be the same: all of them. So in a very long and convoluted nutshell, that’s my answer for recommended points to massage. While I would love for everyone to be empowered to heal themselves and others, an email answer isn’t going to do it. You really need some fundamental knowledge and experience first in order to help someone with a chronic condition. I know it’s not the answer that many people are seeking. You actually have to put the time in to learn and practice. There’s no quick fix or 5-point routine. Chinese Reflexology isn’t about taking a “pill” to make your symptoms go away. It’s about restoring balance with a balanced approach to support your body’s natural healing processes. I offer the Sole Fundamental program once a year for people who want to learn Chinese Reflexology in depth with my guidance and support. If you’re curious to learn more, the 2017 session of Sole Fundamentals began this week and I’ve extended the enrollment period for an additional week. The sooner you start learning, the sooner you can start applying what you’re learning to support amazing health and vitality in yourself and your community. There will always be point combinations for me to share on my blog, but the best gift I can give you is independence, control, and empowerment over your health and well-being. When you study this amazing healing art, you become your own healer. It takes time, energy, and effort to study Chinese Reflexology. I know because I was a student too, but what Chinese Reflexology has given me is priceless. Q&A Monday: Got a Question? Q&A Monday: Chinese Reflexology for Lyme Disease?